The insult-generating “Mud Slinger” application notwithstanding, the apps we review on these pages for the iPhone (News - Alert) and iPod Touch generally aren’t “must-haves,” but meet some other need, typically: boredom-killing, trendiness, convenience, curiosity or impulse buying. And that’s because – and there’s nothing wrong with this – the overwhelming majority of the apps in Apple’s (News - Alert) iTunes App Store are merely distracting, trendy, convenient, strange or existent. Not so the new “MLB.com At Bat 2009” from Major League Baseball Advanced Media, a subsidiary of the venerable organization that Commissioner Bud Selig and Longshoreman Donald Fehr are trying desperately to crush. 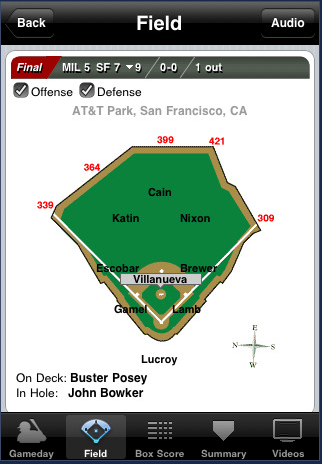 The new app from MLB probably is the “best” baseball product of its kind for Apple’s wildly popular WiFi (News - Alert)-ready devices – but it’s also probably only worth the $9.99 price tag for people like me: Lunatics who live for our national pastime. For a casual or even intermediate fan – someone who follows his local team or teams more or less – there’s the car radio, Internet streaming at work and TV at home. Done. But for those of us in (multiple?) fantasy baseball leagues, for whom picture-in-picture or split-screen views of multiple games, with the radio on, and the laptop Gamecast on the side, are not enough – this is a gem of an item, and a steal at $9.99. But this is more than just another way to follow a ball game. What makes this app so good is its functionality and ease of use. For nearly every game, users have access to a high-quality Web-streaming radio feed from either team, as well as a Gamecast display that’s accurate and whose lag time (by my count) is about three to eight seconds – a better-than-average feat, even for your basic PC Internet connection. 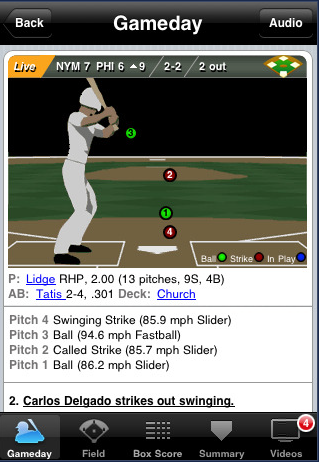 The Gamecast display is unusual in that it actually shows users where the pitches were thrown, accurately (I checked this), the type of pitch, and displays the velocity of each pitch to the tenth of a mile-per-hour. There’s more, of course. Users can listen to one radio feed while “watching” another game, and the radio feeds include pre-game shows and post-game wrap-ups. 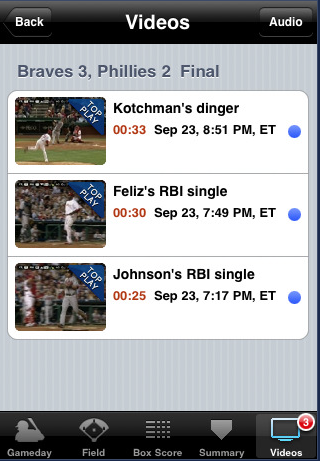 Also, for each game the app feeds mini-videos, usually a minute long or so, with highlights from the field. This happens within an inning or two. And the video feeds are extremely high quality, at least at my apartment, where there's no threat of a neighbor muscling in on our router. (My wife and I are two of five people in the entire building who are younger than 80). 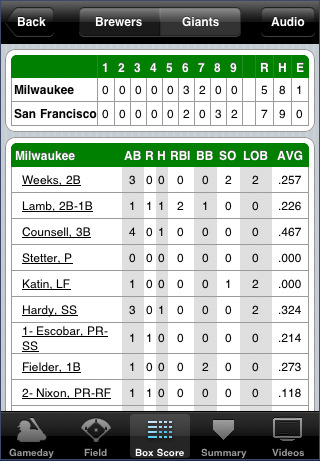 In fact, the app also offers little hot stove report video feeds, fantasy player advice and MLB round-ups. There are a few minor problems. For example, I couldn’t access video highlights from the previous day’s games, and for some games I didn’t have the option of accessing both the home and away team’s radio feed. 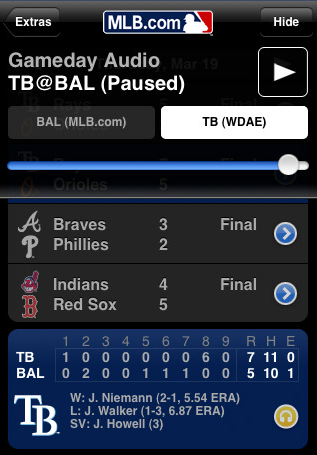 That may be regulated in some way, though I would have thought MLB purchased the rights to all such feeds. The app, released just two weeks ago, likely will gain momentum in the market as the season picks up steam this week. In a move that undoubtedly will annoy my wife, I’m planning to take the company iPod Touch home this weekend for three days of baseball watching, praying that Geovany Soto’s shoulder soreness is minor, that Matt Holliday gets over his illness and that Jayson Werth and Milton Bradley hit the ball.